Merrie Christmas: Man with Christmas Goose, this Norman Rockwell painting, appeared on the cover of The Saturday Evening Post published December 17, 1938. Alternate titles for this painting are just Muggleton Stage Coach, Muggleston Coach and Mister Pickwick. The original oil on canvas painting, 27 x 22 inches or 68.5 x 56 cm, is now held in a private collection. This painting was Rockwell's 183rd overall of 322 total pictures featured on the cover of The Post and the sixth Rockwell cover in 1938. The Post featured a Rockwell illustration on its cover six times in 1938.
on page 139 of Norman Rockwell, A Definitive Catalogue by Laurie Norton Moffatt. The original cover price was still just five cents, although now a magazine in new condition sells for over one hundred dollars. Rockwell's penchant for painting Dickens characters is evident in this painting. Norman Rockwell has been a Charles Dickens afficianado since he was a boy listening to his father read Dickens stories to the family for entertainment. Here we see Rockwell's vision of Mr. Pickwick waiting to catch the Muggleston Stagecoach. Charles Dickens would have been proud to have had his stories illustrated by such a talented and meticulous artist as Rockwell. 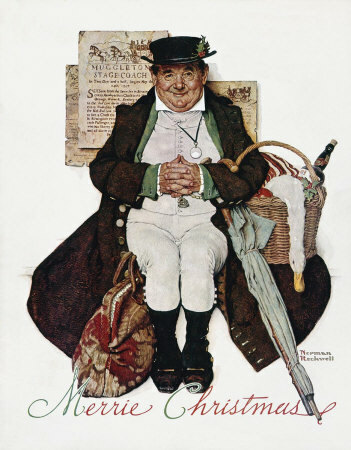 Rockwell's insistence on authenticity and accuracy in his illustrations would have made a Rockwell-illustrated volume of Dickens stories a real treasure. Rockwell uses the visual prop of the poster with the words "Muggleston Stagecoach" to make certain that his subject is understood. Besides the character of Mr. Pickwick, the detail that catches my eye first is the greatcoat. Rockwell's collection of props and costumes was legendary in its time. The greatcoat was most likely an authentic period garment from the period he was portraying. It looks like Mr. Pickwick is going for a Christmas visit. He has everything a good guest would be expected to arrive with. In his basket, he is bringing a goose, fruit, bread, some holly sprigs and, of course, a bottle of wine. Merrie Christmas: Man with Christmas Goose was only one of 322 Norman Rockwell Saturday Evening Post covers; Here is the list of Norman Rockwell Saturday Evening Post cover illustrations. He has his bag packed and has brought his umbrella in case the weather turns inclement. And, of course, his greatcoat is nice and warm. His jolly expression and the holly sprig in the band of his hat assure us that he will have a fine holiday.